As some of you know, I adopted a cat last summer. 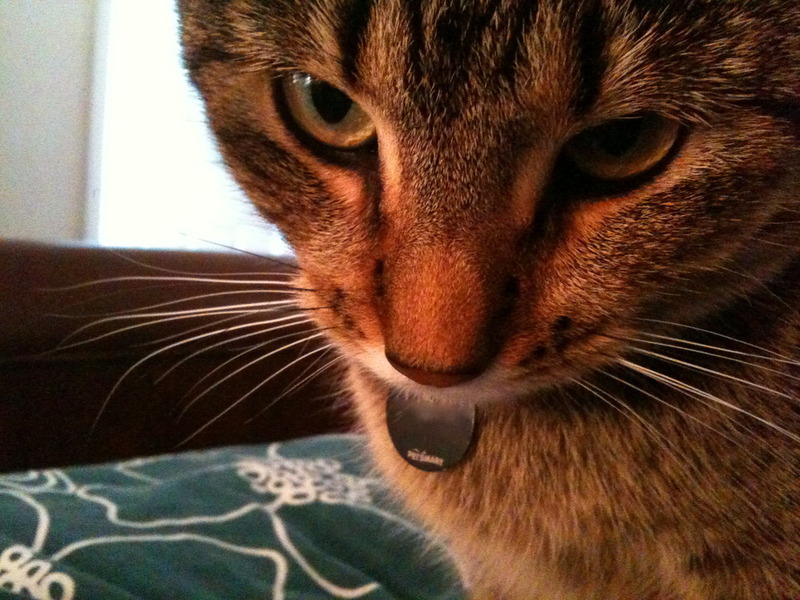 She’s a plain, brown tabby who is really sweet and also very entertaining. She pounces on feet (or anything that moves) and generally tears around the house like crazy. The floors are all tile and wood laminate, so she occasionally slides and crashes in to things while running around the house or chasing after something. She may also have some distant canine relatives since she likes to play fetch. She likes to bat around bottle caps, twisties, toys, and milk jug rings, and she will bring them to me to throw and then chase after them and bat them around, then she brings them back to me to throw again. It’s highly entertaining. 🙂 Since I spend a lot of time at home here, she plays a big part in my life and will likely make appearances in future entries. A couple of weeks ago, I ordered a Slingbox and had it delivered to my parents’ house. It’s a gadget that you connect to a television or other video gadget which then allows you to watch and control that television or gadget over the internet. The idea is that I can use it to watch television and possibly connect it to a DVR if it works well. Getting it all set up proved to be more challenging than initially expected, and thankfully my mother was very patient, but between the two of us we finally got it set up so that I can now watch local cable from home on my computer while I’m here in Mexico. Hopefully, this will help keep me entertained, since entertainment options here are somewhat limited. Also, when I go somewhere further away, where UT football games aren’t broadcast, I’ll have a way to watch them online. 🙂 Hook ’em Slingbox! Due to the violence here, there are a lot of police in CDJ. We have municipal police, federal police, and military police and they all have big pickup trucks that usually carry 2-4 policemen or soldiers inside and 2-5 policemen or soldiers in the bed of the truck. Sometimes, individual trucks are patrolling but sometimes you see them in groups of two or three. Sometimes, when something’s going down, you see a bunch of them racing past you and you get out of the way as soon as you can. Here are a few pictures I found around the interwebs of the federal police trucks to show you what I’m talking about. As you can see, they are also armed a bit differently than the average policeman in the US. I’m not a weapons expert, nor do I play one on TV, but from my observations it looks like they usually carry machine guns or assault rifles as they patrol the city. 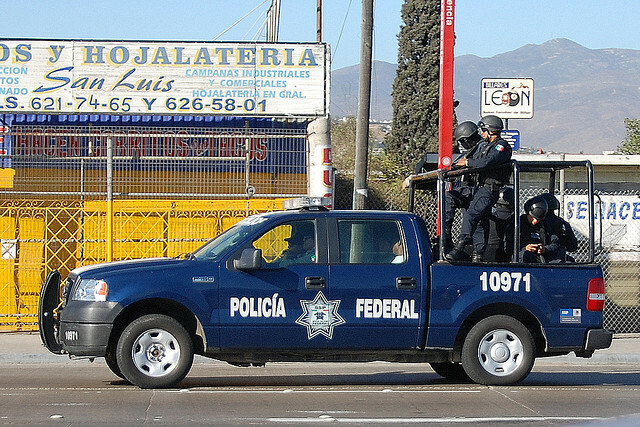 So, now that I’ve explained the police situation here, one of my coworkers hosted a Super Bowl party yesterday and as I was driving from my house to hers, I stopped at a red light and there were two Policia Federal trucks in the lane to my left. The rear truck was about even with my car and the other one was a little bit in front of me while we were stopped at the light, and when the light turned green one truck pulled in to my lane in front of me and one pulled in behind me. So, there I was with 4 to 6 guys with machine guns in the truck in front of me and 4 to 6 guys with machine guns in the truck behind me. I decided that that was not really where I wanted to be, and moved left into the lane that the police trucks had been in, they proceeded to pull over the SUV that had been stopped in front of me at the light, and I went on my merry way to the Super Bowl party. That was the first time I’d been sandwiched between two of the trucks, but I have stopped behind them or next to them at lights before. When I first got here, being stopped or driving next to them made me extremely nervous and I was concerned that I was one speed bump or pothole away from a gun shot to my car or me. However, probably the thing that surprised me the most about the whole thing that happened on the way to the Super Bowl party was my reaction. If this had happened when I first got here, I probably would have freaked out and probably would have thought something along the lines of “OMGWTF! What the hell are these guys doing!?! I’m going to die! Oh well, it was nice while it lasted.” However, yesterday, I just felt annoyed and inconvenienced more than anything since I was going to have to make a right turn soon and they were in the way. Experiences like these to show me just how much my life has changed since I got here, just how different “normal” is now, and how, despite the violence, there are still very normal things going on, like the police pulling cars over. It got up to 57F today in CDJ and things finally seem to have thawed. We had highs in the upper 20s or low 30s and lows from 0 to 15F the past few nights which caused a lot of problems in CDJ and El Paso. Buildings and the electrical system here are not built to handle that kind of cold, so there were rolling blackouts and many of my coworkers lost power and/or water for all or part of the past three days. I hadn’t paid attention to it before, but it seems to be pretty standard construction here to put the hot water heater in the garage or an outside closet in most houses, so many people experienced some sort of freezing in their hot water heater and I heard that a couple of my coworkers’ water heaters actually burst. Others had pipes burst in or outside of their houses. Some of my coworkers attempted to go to El Paso to stay in a hotel because the heat or water wasn’t working in their houses and ended up stuck in line at the bridge to cross into El Paso after Customs and Border Patrol (CBP) lost power. Fortunately, my house weathered the cold pretty well. I didn’t lose power while I was home and had water all through the event, though the pressure did get pretty weak. Things seem to have thawed and I haven’t noticed any ominous dripping or other signs of problems. My heater did stop working sometime overnight from Thursday to Friday, but very fortunately for me, the consulate’s maintenance team was able to fix it on Friday and it’s been working well since! 🙂 It shouldn’t get too much below freezing for the next week, so hopefully we’re out of the woods for this kind of freezing weather. I’m ready for summer!